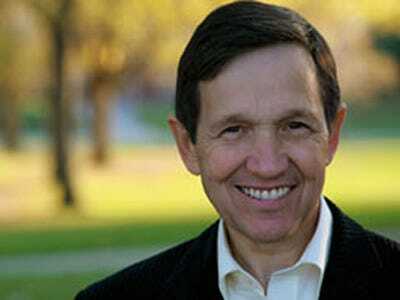 Will Liberal Hero Dennis Kucinich Ultimately Be The Killer Of Healthcare Reform? If you’re keeping a healthcare box score, head on over to FiveThirtyEight.com, where Nate Silver has just published his latest unofficial “whip count,” and concludes that advocates of reform have some reason to be optimistic.But it’s no done deal, and if it does pass, the margin will be razor thin. You see, the vote outcomes are assymetrical.Either it will be a narrow victory, or a major loss, as representatives switch their vote to “no” once they see that the ship is going down. What’s interesting is that Dennis Kucinich — the quixotic leftist Congressman from Ohio — could cast the deciding vote AGAINST reform. For the time being, the only people who look almost certain to switch from yes to no are those Representatives in the Stupak bloc who have concerns about the House bill’s abortion language. However, the Stupak bloc is smaller than Democrats had feared, consisting of a half-dozen members rather than 10 or 12. According to both Chris Bowers and David Dayen, the “Stupak 6” are Bart Stupak himself, Joseph Cao (a Republican), Marion Berry, Kathy Dahlkemper, Joe Donnelly, and Dan Lipinski. Some of these members, such as Donnelly, are in tough districts and probably have reasons other than abortion to vote against the health care bill — as I’ve said all along, I don’t think the potential Stupak defectees are quite as pure-of-heart as they claim to be, but instead are weighing their objections to the abortion language against a whole number of other factors. In any event, if she’s out those six votes, Nancy Pelosi is down to 211 and needs to flip 5 no votes to pass the bill. David Dayen actually lists 6 former no voters in the lean yes category: Jason Altmire, Bart Gordon (retiring), Brian Baird (retiring), John Boccieri, Scott Murphy and Betsy Markey. Of these, I am sceptical of Markey and to a lesser extent Boccieri. On the other hand, the list does not include John Tanner — another retiring member — and there are perhaps a half-dozen other break-glass-in-case-of-emergency potential yes votes. I would not completely rule out Dennis Kucinich, for instance, whose district Obama is visiting tomorrow, even though he’s a stubborn enough son-of-a-gun that efforts to pressure him into voting yes might only backfire. Of course, Kucinich is a big-time advocate of reform. On his website you can sign a petition that states healthcare is a basic human right. But Obamacareisn’t the universal, nationalized solution he favours. So there will be no help from him.